CACKENSTOSE, H. M. None Given 22, Sept. 1845 C03-078 Aged 19 years. Cackenstuse?. Difficult to read. CALDWELL, J. A. 1838 1918 B09-014 Shriners Emblem? CANTLIN, Catherine Ann 1898 1940 D14-009 No surname but in the Cantlin family lot. CANTLIN, Mary Elizabeth 1865 1917 D14-011 No surname but in the Cantlin family lot. "Mother"
CANTLIN, William L. 1862 1947 "D14-010 No surname but in the Cantlin family lot. "Father"
CAPPUCCILLI, Effie G. S. 1894 1981 D10-101 Her maiden name may have been Gilbert, 1st married Smith and name at death is Cappuccilli. CAPRON, Clarence 1861 1890 E04-082 Large Capron monument with Ephraim, Orpha M. & Clarence Capron. Clarence also has a single stone offset. CAPRON, Mary Johnson 1846 1921 E04-083 Johnson is her married name. Single monument by itself and not in line with other monuments. CAPRON/COUGHLAN Family Monument None Given None Given E04-148 One plate missing from this monument. CARBERRY, Dennis J. 1871 1947 D06-170 Dbl. stone with Rose B. Carberry. CARBERRY, Rose B. 1869 1957 D06-169 Dbl. stone with Dennis J. Carberry. CAREY, Mother None Given None Given D02-162 Single stone with only Mother on it but in the Carey lot. CAREY, Sarah Maher 1835 1907 D02-159 Maher is her married name. Dbl. stone with Thomas Francis Carey. CAREY, Thomas None Given None Given D02-158 Single stone with only Thomas on it, but in the Carey lot. No dates given. CAREY, Thomas Francis 1873 1898 D02-159 Dbl. stone with Sarah Carey Maher. CARLIN, Family Monument None Given None Given B06-018 No other data on this monument. CARLIN, Alice A. 1849 1899 B06-018 Single stone with just Alice A. and the dates, but in the Carlin lot. CARLIN, Emeline Dibble Tyler 1823 1902 B07-028 Dibble and Tyler may have been earlier marriages. Carlin seems to be her last. CARLIN, Erminda E. J. None Given None Given E01-109 Single stone in front of family monument. No dates or surnames given. CARLIN, Erminda Emma Jane None Given 20, Oct. 1852 E01-112 Aged 2 yrs. T. J. Carlin Family Monument with Mary his wife, James M., Erminda E. J. Carlin & William & Mary Hendrixon. CARLIN, Father None Given None Given E01-011 Single stone with only Father on it, in front of the Carlin family monument. CARLIN, Francis Wilsey 1843 19__ D11-148 Death date not completed. Wilsey is her married name. CARLIN, James M. None Given None Given E01-112 Single stone with only James M. on it, in front of the Carlin family monument. There was an James M. Carlin in the Conneaut News Herald Dec. 4, 1912, p. 6, who was in the War of the Rebellion. CARLIN, James M. None Given 20, Oct. 1889 E01-112 Aged 45 yrs. T. J. Carlin Family Monument with with Mary his wife, James M., Erminda E. J. Carlin & William & Mary Hendrixon. Hendrixon md. name. CARLIN, Mary Ann Dibble None Given 21, June 1889 E01-112 Dibble maiden name. Age 73 yrs. T. J. Carlin Family Monument with Mary his wife, James M. Erminda E. J. Carlin & William & Mary Hendrixon. CARLIN, Mother None Given None Given E01-110 Single stone with only Mother on it, in front of the Carlin Family Monument. CARLIN, Orson A. 1842 1900 B06-020 Single stone with just Orson A. and the dates, but in the Carlin lot. There was an O. A. Carlin in the Conneaut News Herald Dec. 4, 1912, p. 6, who was in the War of the Rebellion. CARLIN, William H. 1849 1860 D11-149 Dbl. stone with Frances Carlin Wilsey. CARMEDY Family Monument None Given None Given C05-062 No other data. CARMEDY, Elizabeth 1846 1909 C05-061 Stone is off set between rows 5 & 6. CARMEDY, John 1838 1880 C05-062 Stone off set between rows 5 & 6. CARMEDY, Margaret C. Lloyd 1870 1931 C05-060 Lloyd may be her maiden name. Stone off set between rows 5 & 6. CARR, Fredy 17, Feb. 1878 ? ?, July 1887 C09-008 Age 9 yrs., 4 mo's, 24 days. Son of Orwil & M. Carr. Stone on ground. Difficult to read. Day date illegible. Orwil correct. CARR, James C. 1877 1928 C09-007 "At rest"
CARR, Lena R. 3, June 1883 6, May 1903 C09-006 Wife of George O. Carr. CARR, Orvil O. 1851 1914 C09-010 Orvil correct on this stone. CARTER, Adelbert Serene None Given 31, Dec. 1847 F01-07 Carter Family Monument with Franklin, Clarissa, F. Hubbard's wife, Edwin, Katie, Adelbert S. Carter. Age 16 mo's. Son of F. H. & R. F. Carter. CARTER, Carrie Deiette None Given 17, Feb. 1864 C05-110 Aged 4 mos. & 9 days. Dau. of D. K. & C. A. Carter. CARTER, Clarissa None Given 27, Dec. 1842 F01-07 Carter Family Monument with Franklin, Clarissa, F. Hubbard's wife, Edwin, Katie, Adelbert S. Carter. Age 41 yrs. "She sleeps in Jesus." CARTER, Edwin Franklin None Given 19, Feb. 1833 F01-07 Carter Family Monument with Franklin, Clarissa, F. Hubbard's wife, Edwin, Katie, Adelbert S. Carter. Age 4 yrs., 10 mo's. Dau. of F. H. & C. Carter. CARTER, Franklin Hubbard None Given 17, June 1860 F01-07 Carter Family Monument with Franklin, Clarissa, F. Hubbard's wife, Edwin, Katie, Adelbert S. Carter. Age 69 yrs. "He has gone to rest." CARTER, Katie None Given 12, Oct. 1843 F01-07 Carter Family Monument with Franklin, Clarissa, F. Hubbard's wife Edwin, Katie, Adelbert S. Carter. Age 10 mo's. Dau. of F. H. & C. Carter. CARTER, Orpha Veronia None Given 17, Feb. 1861 C05-108 Aged? yrs. Wife of D. (N?) or K. Carter. Weathered adn difficult to read stone lying on it's back on the base. CARTNER, Elizabeth I. 1912 1968 E08-115 Between rows 8 and 9. CATHCART, Caroline C. None Given 1, Feb. 1855 D05-155 Aged 35 yrs. Wife of H. Cathcart. CATLIN, Diana Puffer None Given 7, Dec. 1885 C10-029 Aged 76 yrs. On North side of monument. See spitaph page. Wife of E. Puffer. Puffer is her married name. CHADMAN, Charles E. 1872 1916 E01-042 Stone under some brush. CHADMAN, Elizabeth "Mother" 1827 1903 E01-044 Chadman family monument. Elizabeth "Mother", Sarah E. Martin and John B. "Father" Chadman. CHADMAN, Naomi None Given None Given E01-043 No dates given. Stone under some brush. CHADMAN, Sarah E. Martin 1856 1939 E01-045 Chadman family monument. Elizabeth "Mother", Sarah E. Martin, and John B. "Father" Chadman. Martin may be her maiden name. CHAPIN, Robert H. 1887 1929 E03-095 Linn family monument with Edgar, Harriet Hawley Linn, his wife; Robert H. Chapin, Alice S. Linn, Infant Linn. CHAPMAN Family Monument None Given None Given E08-102 No data on this monument. Offset between rows 8 & 9. CHAPMAN, Cynthia Olds July 1829 July 1918 E08-101 No day dates given. Olds may be a maiden name. Wife of William B. Chapman. CHAPMAN, Eddie 1834/35 1834/35 E08-101 Between rows 8 & 9. Badly weathered. It is a baby or two. It may be Fanny and Eddie or just one. Almost illegible. CHAPMAN, Fanny 1834/35 1834/35 E08-101 Between rows 8 & 9. Badly weathered. It is a baby or two. It may be Fanny and Eddie or just one. Almost illegible. CHAPMAN, Juliett None Given 22, July 1856 D03-1456 Aged 18 yrs. Dau. of E. & M. Chapman. CHAPMAN, Polly 1805 1848 E08-100 Badly weathered & broken. CHEESEMAN, Velnette 1836 1894 D10-075 "Mother"
CHEESEMAN Family Monument None Given None Given E06-159 Monument with Lizzie, Deborah E., Lucien D. Cheesman & Louise Johnson. Offset between rows 6 & 7. CHEESMAN, Lenna Johnson 1886 1959 E07-159 Johnson is her married name. CHEESMAN, Lizzie 1873 1882 E06-155 "Watching and Waiting"
CHEESMAN, Louise Johnson 1912 1985 E06-157 On the Cheesman Family monument but surname appears to be Johnson. CHEESMAN, Nellie L. 1862 1902 E07-158 Single stone with just Nellie L. and the dates on it. In the Cheesman lot. CHENEY None Given None Given E02-037 Huge stone with Cheney on it. Nothing else. CHENEY, Azro J. 1886 1972 E01-036 Dbl. stone with Bessie H. Cheney. CHENEY, Bessie H. 1885 1969 E01-035 Dbl. stone with Azro J. Cheney. CHENEY, C. E. 1859 1938 E01-034 Dbl. stone with Lillian, his wife. CHENEY, Charles L. 1846 1885 E05-092 Stone with Agnes F. Cheney. CHENEY, Julia E. 1817 1907 E01-038 Wife of A. J. Cheney. CHENEY, Lillian 1860 1952 E01-033 Dbl. stone with C. E. Cheney. "his wife"
CHERRIER, Benjamin 21, Aug. 1782 20, Sept. 1870? C11-088 Born at Quebec. Death date difficult to read. Stone broken but sitting up. CHERRY, Frances None Given None Given D09-113 Stone with James Cherry. No other data given. CHERRY, James None Given None Given D09-113 Stone with Frances Cherry. No other data given. CHERRY, Tom C. None Given None Given D09-117 This is not a monument, but an urn with only his name on it. No other data. CHIDESTER, James None Given 10, Nov. 1868 E02-167 Aged 11 yrs., 5 mo's., 29 dys. CHILDS Family Monument None Given None Given C07-086 No data on this monument. CHILDS Family Monument None Given None Given C07-070 No data on this monument. CHILDS, Cyrus 1829 1902 C07-084 No surname but in the Childs lot. CHILDS, Lucinda 1805 1870 C07-071 Single stone with no surname but in the Childs lot. CHILDS, Lydia P. 1836 1914 C07-085 No surname but in the Childs lot. CHRISTENSON, Lena C. 1884 1970 E12-123 Dbl. stone with Ray H. Christenson. CHRISTENSON, Ray H. 1888 1950 E12-122 Dbl. stone with Lena C. Christenson. CLARK TYLER Family Monument None Given None Given B07-030 Large Tyler/Clark family monument with no data on it. CLARK, Albert B. None Given 1, June 1830 D06-157 Age 5 yrs., 8 mo's., 4 d's. Son of Daniel and Laura Clark. CLARK, Celia Sanborn None Given None Given E02-089 Single stone in front of Clark family monument. No dates given. Sanborn may be her maiden name. Husband Rufus Clark. CLARK, Celia Sanborn Not Given 7, Aug. 1886 E02-089 Aged 64 years, 8 mo's and 29 dys. Clark family monument with Rev. Rufus Clark. Sanborn was her maiden name. CLARK, Eliza M. DeWolf 1831 1894 B07-027 DeWolf was her maiden name. CLARK, Elizabeth Maynard 1794 1866 E01-167 Maynard Family Monument with Watrous, his wife, Elizabeth Clark Maynard, Elizabeth, Jane, Henry C. & James Maynard. Watrous md. name. CLARK, Elvira Phillips None Given 26, Sept. 1887 C04-051 Aged 76 yrs, 7 mo. 21 days. Wife of David Phillips and wife of D. B. Clark. CLARK, Eugene None Given 16, March 1840 D06-158 Aged 1 or 4 yrs., 2 mo's. One grave with Loren, Henry D. & Eugene. Children of Daniel & Laura Clark. Can't be sure about the age. CLARK, Henry D. None Given 12, March 1840 D06-158 Aged 5 yrs. & 20 days. One grave with Loren , Henry D. & Eugene. Children of Daniel and Laura Clark. CLARK, Janette Hewitt None Given 3, Sept. 1901 D06-162 Aged 70 yrs. Wife of Capt. E. M. Hewitt. Hewitt is her married name. CLARK, Laura E. Colby Betts 1842 1923 E02-086 Colby may be her maiden name and Clark her first married name. Betts her present married name. CLARK, Laura Putney None Given 6, May 1897 D06-163 Aged 98 yrs. Wife of Daniel Clark. Putney may be her maiden name. See Death Register. CLARK, Loren None Given 3, March 1832 D06-158 Aged 3 yrs., 7 mo's, 9 d's. One grave with Loren, Henry D., & Eugene. Children of Daniel & Laura Clark. CLARK, Rev. R. Not Given Not Given E02-090 Single stone with no dates. In front of the Clark family monument. CLARK, Rufus Not Given 25, Nov. 1889 E02-089 Aged 70 yrs. 2 dys. Clark family monument with Celia Sanborn Clark. He was for 50 years an earnest F. W. B. Preacher. CLARKE, Charles P. None Given 1976 C08-085 Clarke monument with Sarah, Clara M., Lila M., Charles P. Clarke. Only one date for each of these. CLARKE, Clara M. None Given 1956 C08-083 Clarke monument with Sarah, Clara M., Lila M., Charles F. Clarke. Only one date for each of these. CLARKE, Lila M. Not Given 1974 C08-084 Clarke monument with Sarah, Clara M., Lila M., Charles P. Clarke. Only one date for each of these. CLARKE, Myrtle M. 1882 1960 E04-119 Dbl. stone with William J. Clarke. CLARKE, Sarah None Given 1955 C08-082 Clarke monument with Sarah, Clara M., Lila M., Charles P. Clarke. CLARKE, William J. 1869 1953 E04-120 Dbl. stone with Myrtle M. Clarke. CLEVELAND Family Monument None Given None Given C05-099 No data on this monument and between rows 5 & 6. CLEVELAND, A. E. Latimer 1808 1891 E06-123 Latimer may be a maiden name or another married name. In the Cleveland lot. CLEVELAND, Alice & Emma None Given 1845 C05-097 Dbl. stone with no surname but in the Cleveland lot. Only one date for both. Probably children. CLEVELAND, Anna 1785 1855 C05-101 Single stone with no surname but in the Cleveland lot. CLEVELAND, Anna J. 1850 1939 C06-100 Single stone with Ann J. and the dates but no surname. In the Cleveland lot. Almost row 7. CLEVELAND, Catherine L. 1945 1852 C06-096 Single stone with just Catharine L. and the dates but in the Cleveland lot. Stone between row's 6 & 7. CLEVELAND, Clarence S. 1874 1917 D13-083 Dbl. stone with Mable Dowler Cleveland. CLEVELAND, Cynthia S. 1801 1864 C05-096 Single stone with Fanny W. Houghton on it. It's in the Cleveland lot. CLEVELAND, Fanny W. Houghton 1843 1845 C05-096 Single stone with Fanny W. Houghton on it. It's in the Cleveland lot. CLEVELAND, George S. 1821 1887 C06-097 Single stone with just George S. and the dates but in the Cleveland lot. Stone between rows 6 & 7. CLEVELAND, George S. 1861 1895 C06-101 Single stone in the Cleveland lot with no surname. It is the second George S. in the lot. Almost row 7. There was an Giles Cleveland in the Conneaut News Herald Nov. 22, 1912, p. 4, who was in the War of the Rebellion. CLEVELAND, Helen C. Wilcox 1848 1924 C06-099 Cleveland may be her maiden name or her married name. Helen C. Wilcox is on her stone but in the Cleveland Lot. Almost row 7. CLEVELAND, Lotta Leggett 1867 1915 E07-123 Wife of J. R. Leggett. Leggett is her married name. CLEVELAND, Lydia A. Stafford 15, July 1841 26, Oct. 1902 E06-124 Wife of Geo. H. Cleveland. Stafford may be a maiden name. CLEVELAND, Lydia Jane 1826 1913 C06-098 Single stone with just Lydia Jane and the dates but in the Cleveland lot. Stone between rows 6 & 7. CLEVELAND, Mable Dowler 1881 1953 D13-084 Dbl. stone with Clarence s. Cleveland. Dowler may be her father. CLEVELAND, Oliver 1787 1869 C05-100 Single stone with no surname but in the Cleveland lot. CLEVELAND, Robert L. 1855 1857 C06-094 Single stone with just Robert and the dates but in the Cleveland lot. Stone between rows 6 & 7. CLEVELAND, William L. 1868 1869 C06-095 Single stone with just William L. and the dates but in the Cleveland lot. Stone between rows 6 & 7. CLIPPINGER, Ruth Jones 1887 1951 A02-005 Jones may be her maiden name. COCHRAN COOK Family Monument None Given None Given C06-055 Family monument with one side panel out. Austin Cook and H. E. Cochran are on this monument. COCKRAN, H. E. 25, Oct. 1860 4 Nov. 1892 C06-055 On this Cook family monument. Aged 32 years. COLANGELO, Louis J. 29, March 1914 19, Nov. 1973 C06-072 Oh. T. Sgt. US Army WWII. US war vet flag holder. COLBY, Laura E. Clark Betts 1842 1923 E02-086 Colby may be her maiden name and Clark her first married name. Betts her present married name. COLE, Calista M. Not Given 19, Aug. 1881 C08-047 Aged 73 yrs., 2 mo's, 19 dys. Stone on ground off base. Too heavy to lift. COLE, Deadrah None Given None Given C08-049 Wife of B. E. ?Rest illegible. Very weathered. Stone of face on ground. COLE, Gilbert 1848 1907 C08-048 Son of Harvey & Calista Cole. COLE, Mary Keyes None Given 19, Dec. 1824 C06-123 Aged 28 yrs. Keyes is her married name. On Keyes family monument with others. COLLIER, Fannie M. 1884 1975 C01-066 Dbl. stone with Perry J. Collier. COLLIER, Perry J. 1881 1962 C01-065 Db. stone with Fannie M. Collier. COLLINS, Sarah Palmer 1874 1961 C04-004 Palmer may be her maiden name. COLSON, A. Louisa 1854 None Given C10-108 Triple stone with Frank, A. Louisa and Clyde L. Colson. No death date given. COLSON, Clyde L. 1874 None Given C10-109 Triple stone with Frank, A. Louisa and Clyde L. Colson. No death date given. COLSON, Frank M. 1848 1916 C10-107 Triple stone with Frank, A. Louisa and Clyde L. Colson. COLSON, Lydia Wright 1827 1910 E03-144 Wright is her married name. COLT Family Monument None Given None Given C01-103 See epitaph page. The epitaph is too long for this space. COMSTOCK ALLYN Family Monument None Given None Given E08-139 No data on this monument. Offset between row's 8 & 9. COMSTOCK, Millie A. 1860 1907 E08-138 Wife of E. M. Comstock. CONRAD, E. B. 1846 None Given D08-107 No death date given. CONRAD, Sarah L. 1850 1913 D08-106 Wife of E. B. Conrad. COOK COCHRAN Family Monument None Given None Given C06-055 One side panel out. Austin Cook and H. E. Cochran on this monument. Single monuments go with this large monument. COOK, Austin 10, Jan. 1836 21, Sept. 1854 C06-057 On the main monument and also just Austin on a Single monument in the cook/Cochran lot. COOK, Charles None Given None Given C06-059 Single stone with just Charles on it, in the cook/Cochran lot. Vet flag holder. There was an Charles Cook in the Conneaut News Herald Nov. 21, 1912, p. 4, who was in the War of the Rebellion. COOK, Hiram None Given None Given C06-056 Single stone with just Hiram on it and in the Cook/Cochran lot. COOK, Mary None Given None Given C06-058 Single stone with just Mary on it and in the Cook/Cochran lot. COOL, Angeline Dibble 1819 1899 E03-107 Dibble may be her maiden name. Dbl. stone with Nelson Augustus Cool. COOL, Mary H. Griffey 17, April 1822 10, March 1888 E04-106 On the Family monument with George Griffey. Griffey is her married name. CORNER MARKER None Given None Given C11-040 Tree grown around it, but it is not a grave marker. COTTINGHAM, Carrie L. None Given 23, Aug. 1931 D07-141 Dbl. stone with John C. Cottingham. No birth date or age given. COTTINGHAM, John C. None Given 26, Oct. 1847 D07-142 Dbl. stone with Carrie L. Cottingham. No birth date or age given. COUGHLAN Family Monument None Given None Given E03-101 No data on this monument. (also spelled Caughlan) 25, Dec. 1824 11, April 1891 E04-145 Coughlan/Capron family monument and one panel missing from the monument. COUGHLAN, Bess Johnson 1875 1949 C06-005 1st President of Cowle Post 151 American Legion Aux. Johnson is her married name. COUGHLAN, Fred E. None Given 10, June 1882 E04-146 Age 37 yrs. Coughlan/Capron family monument & one panel missing. COUGHLAN, G. E. None Given None Given C06-007 Single stone with only the name on it. No other data given. COUGHLAN, Josie None Given None Given C06-006 Single stone with just the name. No other data given. COUGHLAN, Paulina Maynard 15, May 1836 12, Feb. 1892 C11-027 "Tis morn with her and night with us". Maynard may be her maiden name. COUGHLAN/CAPRON Family Monument None Given None Given E04-148 Large monument sitting sideways in this row. COWDEN, Mary R. 1877 1971 G02-24 Dbl. stone with Keith W. Cowden. COZENS, Amos None Given None Given D11-052 Aged 9 mo's. Son of ? & ?, The rest is illegible. Weathered badly and on ground. COZENS, Charles B. 24, Sept. 1841 20, Feb. 1882 D11-051 "His work is done"
22, Aug. 1818 D11-055 Aged 28 yrs. Wife of G. A. Cozens. Was b. ca 1796. COZENS, Sarah Fifield 1831 1912 D11-053 Cozens is her married name. Wife of Gustavus A. Cozens. CRAM, Lorenzo None Given 6, April 1836 D10-126 Age 19 yrs., 3 mo's. Difficult to read the year he died. CRANDALL, Isaac 1823 29, Aug. 1855 F11-01 Crandall family monument. There was an John Crandall in the Conneaut News Herald Dec. 6, 1912, p. 3, who was in the War of the Rebellion. CRANE, William W., Lieut. None Given None Given E05-167 Co. K, 7 Kans. Cav. US War Vet flag holder. No dates given. CRITTENDEN, Alfred 28, April 1804 12, March 1898 F06-11 Crittenden family monument. Lydia, his wife. Monument with Lydia W. Crittenden. CRITTENDEN, Father None Given None Given F06-13 Single stone with only Father on it and in the Crittenden lot. CRITTENDEN, Mother None Given None Given F06-12 Single stone with only Mother on it and in the Crittenden lot. CROCKER, Catherine Smith 1892 1949 E06-114 Smith may be a maiden name. CROCKER, Joan Lomax, Prof. 10, Dec. 1916 1, Nov. 1990 E06-115 Lomax is her married name. CROCKER, Sally S. None Given 27, Dec. 1872 D03-144 Aged 38 yrs. Wife of J. L. Crocker. B. ca 1834. CROSBY, Betsey 1812 1880 E01-081 Judd/Crosby family monument with Byron and Addie C. "his wife" Judd; George W. & Betsey "his wife" Crosby. Betsey on East side. CROSBY, Betsey None Given None Given E01-082 Single stone with only Betsey on it, but goes with the Crosby family monument. CROSBY, George None Given None Given E01-083 Single stone with only George on it, but goes with the Crosby family monument. CROSBY, George W. 1811 1873 E01-081 Judd/Crosby family monument with Byron and Addie C. "his wife" Judd; George W. & Betsey "his wife" Crosby. George on East side. CROUCH, Rex 1917 1918 D14-020 Same grave as Catharine Lyon. Stone on ground behind Catharines. CULKEEN Family Monument D14-020 Family monument with Thomas, Margaret, his wife, Julia, Delia and Catherine Culkeen. CULKEEN, Catherine 1828 1896 D14-020 Family monument with Thomas, Margaret, his wife, Julia, Delia and Catherine Culkeen. CULKEEN, Delia 1847 1863 D10-087 Family monument with Thomas, Margaret, his wife, Julia, Delia and Catherine Culkeen. CULKEEN, Delia 1847 1863 D14-020 Family monument with Thomas, Margaret, his wife, Julia, Delia and Catherine Culkeen. CULKEEN, Julia 1846 1873 D10-087 Family monument with Thomas, Margaret, his wife, Julia, Delia and Catherine Culkeen. 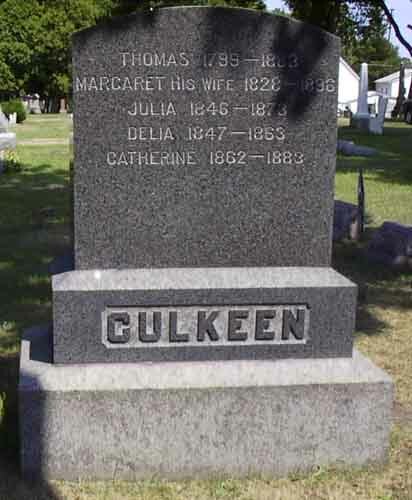 CULKEEN, Julia D10-090 No surname or data but in the Culkeen lot. CULKEEN, Thomas 1799 1883 D14-020 Family monument with Thomas, Margaret, his wife, Julia, Delia and Catherine Culkeen. CUMMINGS, Elizabeth R. None Given 8, April 1863 C08-111 Aged 46 yrs. Wife of G. W. Cummings. CUMMINGS, Frank None Given None Given C08-112 Frank on top of the stone but nothing else engraved on it. It is in the Cummings lot. CUMMINGS, Sabrina None Given 14, Nov. 1869 C08-113 Aged 84 yrs. CUMMINS, Carl R. None Given 29, Nov. 1882 C02-058 Aged 5 mo's. "Son of H. A. & C. R. Cummins." CUMMINS, Catherine R. Brown 1858 1893 C02-059 "Wife of H. A. Cummins". Brown may be her maiden name. See 1880 United States Census. CUMMINS, Ralph W. None Given 20, Jan. 1883 C02-057 Aged 2 yrs., 2 mo., 20 dys. "Son of H. A. & C. R. Cummins." CUMMINS, Thomas Chester None Given 10, March 1854? C02-056 Son of ? & R. Cummins. Aged ?, 12 days. Weathered & parts are illegible. Death date may be incorrect. CURPHEY, Catherine L. 1864 1935 C04-036 Dbl. stone with Edward M. Curphey. CURPHEY, Edward M. 1856 1943 C04-037 Dbl. stone with Cathernie L. Curphey. CURTIS, John 1822 1900 E01-089 Dbl. stone with Julia E. "his wife". Stone the shape of a heart. CURTIS, Julia E. 1832 1911 E01-090 Dbl. stone with John Curtis. "his wife". Heart shaped stone. CURTIS, William H. 25, Aug. 1840 3, Dec. 1887 E01-086 William may be wrong. Difficult to read. CUSHING Family Monument None Given None Given C02-023 Between row's 2 & 3 and has been pushed on the ground. No data on the monument. CUSHING, Alice Mina Lewis 24, July 1850 27, Jan. 1920 C02-024 No age or birth date given. Lewis may be her maiden name. "Wife of J. R. Cushing. CUSHING, Benjamin 10, Nov. 1807 14, Feb. 1882 C01-022 Father on front of stone. CUSHING, Benjamin None Given 19, June 1842 D11-153 Aged 78 yrs. Dbl. stone with his wife, Sally Cushing. CUSHING, Benjamin F. 1851 1926 E05-067 Vary difficult to distinguish between a 1 and 4 after the stones have weathered. Death day may be 1 instead of 4. CUSHING, Edna 1880 1887 E05-068 Dbl. stone with Lelia Cushing. CUSHING, Edward A. None Given 9, Feb. 1839 D11-156 In the 21st yr. of his age. Son of Benjamin & Sally Cushing. CUSHING, Edwin S. None Given 22, Oct. 1836 D11-157 In the 22nd yr. of his age. Son of Benjamin & Sally Cushing. CUSHING, Frances C. 19, April 1854 7, May 1881 C02-025 Woodworth may be her maiden name. "Wife of J. R. Cushing"
CUSHING, Granville G. 1886 1918 E05-069 On ground on it's back, on the edge of the bank. CUSHING, Jason Roscoe 5, May 1852 15, Nov. 1890 C02-026 Roscoe engraved on the front of the stone, May be a family surname. CUSHING, Nancy Swain 3, April 1812 17, Dec. 1886 C01-023 Swain may be her maiden name. Mother on front of stone. CUSHING, Pluma V. Maxham 7, July 1837 3, Oct. 1870 C01-025 Cushing may be her maiden name. "Wife of H. O. Maxham"
CUSHING, Sally None Given 1, Feb. 1843 D11-153 Aged 67 yrs., 9 mo's, 12 days. Wife of Genjamin Cushing & both on this one stone. B. ca 1776.